The 2018 RealtySouth Top Producers decided that, instead of spending money on trophies or other prizes this year, they would use that money to adopt an apartment for Red Mountain Grace. Journal photos by Ingrid Howard. Stacey Booth, a nurse at Children’s of Alabama in Birmingham, had a plan for her life: go to college, get a job, get married, have kids and live happily ever after. But when her husband, Brad, was diagnosed with cancer in 2010, she realized that cancer didn’t care about her hopes and dreams. Stacey worked part time at Children’s so she could help take care of Brad. Brad went on disability at his law firm, Carr Allison. The medical bills began piling up. Brad’s cancer was a rare, incurable pediatric sarcoma. At the time, there were only 250 other known cases. The family moved to Houston, Texas, so Brad could be treated at the University of Texas MD Anderson Cancer Center. The Booths recognized that they could not do this alone, and they received support from a ministry that provided them housing. Birmingham has a similar ministry called Red Mountain Grace. Red Mountain Grace has 21 apartments in the Birmingham area, a number that is about to become 22. The 2018 RealtySouth Top Producers decided that, instead of spending money on trophies or other prizes this year, they would use that money to adopt an apartment for Red Mountain Grace that will be sustainable for a year. This was revealed during an event at Haven on March 5. For the Booths, having the apartment provided was a gamechanger. 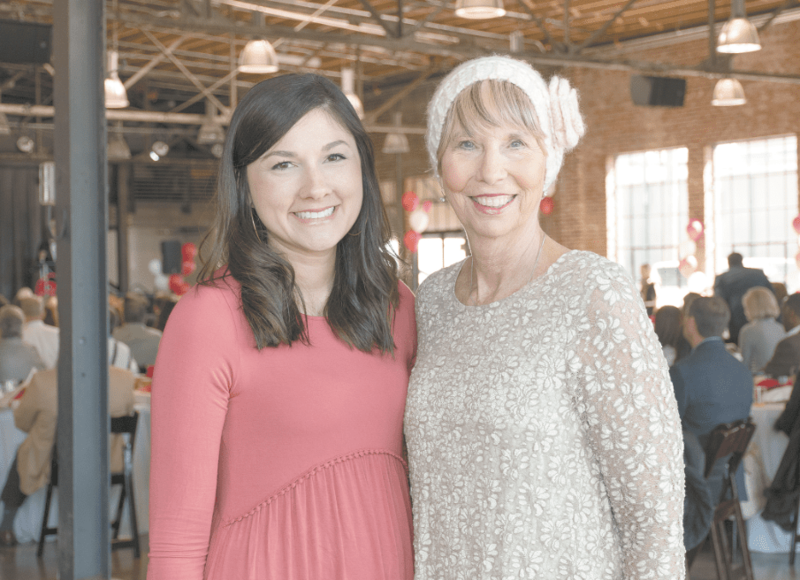 Stacey Booth, left, became a supporter of Red Mountain Grace after benefiting from a similar organization when her husband was battling cancer at MD Anderson and Jeanie Mckay, right, currently lives in housing provided by Red Mountain Grace. The ministry also provided emotional support. Brad went into a three-year remission, and the Booths had a “break from the battle.” During this time, they discovered Red Mountain Grace in their hometown. They started working together, and Stacey began speaking at engagements for the organization. Brad lost his battle with cancer 15 months ago, after 10 years of marriage with Stacey. But Stacey continues to share their story. Red Mountain Grace has served more than 350 patients with stories like the Booths’ since its founding in 2013. In the past year alone, it has opened nine new apartments to its clients. The new apartment being funded by the RealtySouth Top Producers will be a one-bedroom, one-bathroom in Jemison Flats, at First Avenue North in Birmingham. It has a secure parking deck, onsite gym and Wi-Fi cafe and is walking distance to other amenities. When the Top Producers contribution was revealed at the March 5 RealtySouth event, they had the opportunity to meet representatives from Red Mountain Grace and those affected by their services. Jeanie McKay, who was diagnosed with breast cancer last year, currently lives in housing provided by Red Mountain Grace. McKay was a cancer nurse at UAB for 25 years but had been living in Columbus, Florida, when she was diagnosed. She decided to return to UAB because of the quality of care there. A social worker at UAB connected her with Red Mountain Grace, and she moved into her apartment with her husband in January. To donate, request an apartment or learn more about the organization, visit redmountaingrace.com.